Sunday afternoon, time to note down some thoughts of the week. News that left a smile on my face, and the usual, inevitable rantings that keep on coming up. Since I often use this wonderful resource online, I would like to contribute with a small donation ( kichango, kuchangizana!) and like to encourage you to do the same if you use that website on a regular basis. Asante sana! Which came packaged in paper and some sort of soft plastic bag. I don’t know what kind of material that foil is made out of of since it only comes with the Resin identification code (number) 07 – which includes acrylic, polycarbonate, nylon or fiberglass as the possible polymers used on this packaging. Sure, this bag also has the Green Dot® symbol on it (some dumb marketing trick by german packaging companies to avoid the costs of taking back packaging material from customers) so I know where to dispose off this bag after purchasing the clothes sealed within. However, it still makes me feel bad. So much material / resources used for preventing underwear from becoming dirty on their way from the manufacturer to the customer. No wonder H&M buy their clothes in China – the country where they treat environmental issues like we did in the 1950’s…the only difference being that we don’t seal everything a thousand times. Don’t believe me? Then go to a shop where they sell Asian Foodstuff, buy a pack of tea (=> Lo Han Kuo tea!) and take your time to analyse the different materials they use for sealing a half inch cube of powdered tea. Back to my pants boxer shorts: H&M – please tell your manufacturers to change this sort of packaging. Thx! 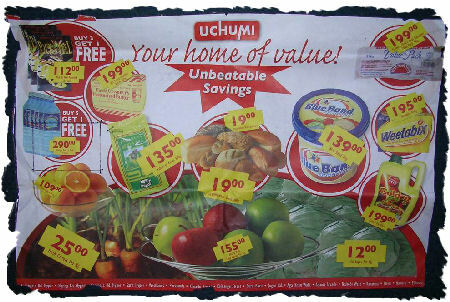 check out this recent advertisment from UCHUMI supermarkets in Nairobi, Kenya. 199/= Kshs (~ EUR 2,26) for a 500gr piece of salted butter. I think a lot of Exilkenyaner are suffering from this. Next time you’re in Kenya, your auntie at home will have to buy you a meal, ama? 6. Anja of mwende.de has blogged a small dictionary of Kikamba-German. Great job, Kambamoja! Clearly Kenya is not for the weak and down trodden!